The latest data indicates that 71.6 percent of adults over the age of 20 are either overweight or obese. Are you part of this group? If you’ve been struggling with your weight and can’t seem to get rid of those extra pounds, your diet might be to blame. At the same time, though, it’s hard to know what you ought to be eating when there’s so much conflicting information out there. For example, some folks say chicken is the healthiest meat to consume, while others say you should always opt for turkey. Are you unsure of where you stand on the turkey vs chicken debate? If so, keep reading. All the facts are listed below to help you decide which lean meat you want to eat! When most people start practicing clean eating for weight loss, chicken becomes a staple in their diet. How healthy is chicken, though? Both chicken and turkey contain white meat and dark meat. White meat is lighter in color because it is lower in a protein known as myoglobin, which is responsible for transporting and storing oxygen in the muscles. Dark meat contains higher amounts of myoglobin, which explains its reddish-brown color. The white meat in chicken and turkey is found mainly in the breasts and wings. 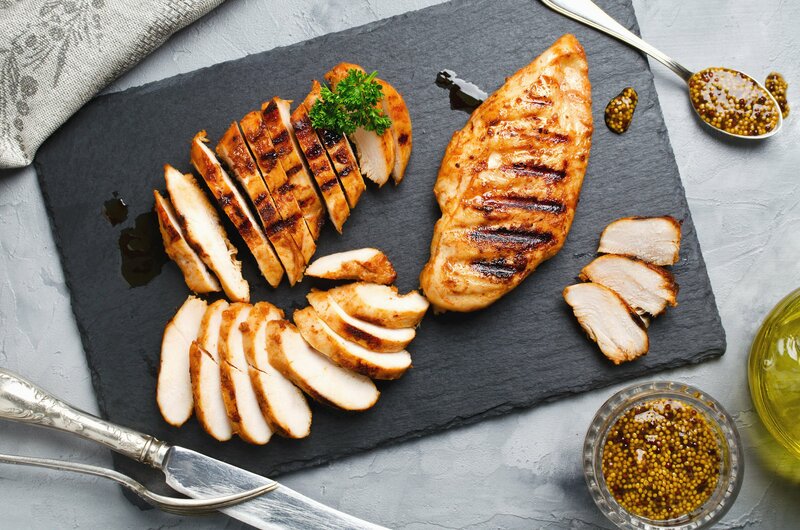 Chicken breasts are high in protein and low in fat and calories. An ounce of chicken breast meat contains approximately nine grams of protein and approximately one gram of fat. It also contains approximately 46 calories. Chicken wing meat is similar to breast meat when it comes to protein content — roughly nine grams per ounce. Chicken wing meat contains slightly more fat — approximately two grams per ounce. But, this is a negligible difference to most people. One ounce of chicken wing meat yields about 56 calories. What about the dark meat? The dark meat in chicken is found mainly in the legs (or drumsticks) and thighs. Chicken legs, like chicken breasts and wings, contain a significant amount of protein – approximately eight grams per ounce. One chicken leg with the skin left on contains 97 calories and 12 grams of protein. It also contains about five grams of fat. With the skin removed, you can save yourself a few calories — a skinless leg yields 66 calories and 11 grams of protein. It also only contains two grams of fat. Chicken thighs, like chicken legs, are high in protein and higher in fat than breasts or wings. With the skin left on, a chicken thigh contains approximately 64 calories, 6.5 grams of protein, and four grams of fat per ounce. Without the skin, a chicken thigh contains just 55 calories, seven grams of protein, and 2.7 grams of fat per ounce. Should You Only Eat White Meat? Some people are under the impression that they should only be eating white meat. As you can see, though, there is not that much of a difference between white and dark meat, with the exception of a slightly higher fat content. If you prefer the taste of dark meat, feel free to enjoy it! At the end of the day, as long as you’re consuming fewer calories than what your body burns, you will lose weight. Nutrition is key, but you don’t need to be too picky when it comes to splitting hairs over white and dark meat. It’s important to note, too, that dark meat and white meat contain different micronutrients. For example, white meat is higher in B vitamins like niacin and B6, while dark meat is higher in zinc. Okay, so chicken is pretty darned healthy. What about turkey? The white meat of turkey is primarily found in the breast. In terms of calories, fat, and protein, turkey breast and chicken breast are similar. Turkey breast contains about 44 calories, six grams of protein, and two grams of fat per ounce. Chicken breast contains slightly more protein and slightly less fat. But, to most people, these differences are negligible. Unlike chicken, turkey wings are considered to be dark meat. One roasted turkey wing contains approximately 220 calories and 11 grams of fat. Clearly, they are a higher calorie and higher fat food than a chicken wing. But, they also contain important micronutrients like the mineral selenium. Turkey legs and turkey thighs also fall into the dark meat category. Per ounce, a turkey leg contains approximately 47 calories, 1.5 grams of fat, and eight grams of protein. The calories, protein, and fat in a turkey thigh are similar to those in a chicken thigh. Per ounce, a turkey thigh contains about 45 calories, 5.5 grams of protein, and 2.6 grams of fat. As you can see, chicken and turkey are both great sources of protein. Whether you’re consuming the breast, the thigh, the wing, or the leg, chicken and turkey contain protein, small amounts of fat, and beneficial micronutrients like selenium, zinc, and B vitamins. In short, it’s up to you and your preferences. When it comes to calories, proteins, and micronutrients, both chicken and turkey are great options. Chicken can be more affordable than turkey for some, and it may be more widely available. Others, though, find that they prefer the taste of turkey over the taste of chicken. Give them both a try and decide which one you like more! Turkey vs Chicken: Which Do You Choose? Now that you know more about both protein sources, where do you stand on the turkey vs chicken debate? At the end of the day, both chicken and turkey are lean, healthy options that can help you achieve your weight loss goals. Are you looking for more weight loss help? Would you like to be part of a program that takes all the guesswork out of your nutrition? If so, the ChiroThin program might be just the thing for you. Use our free search tool to find a ChiroThin doctor in your area today. Stick to this program and you’ll see the weight fall off in no time.